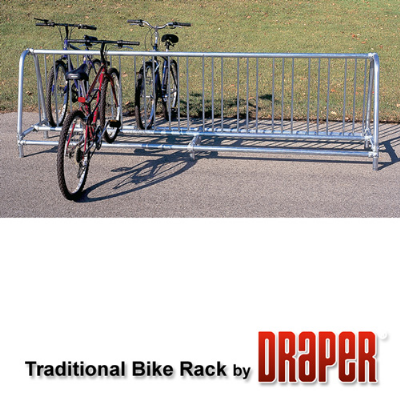 Single Sided Draper Traditional Style Bike Racks offer a design that groups rungs to facilitate uniform storage and allow for easier entrance and exit of bicycles. Bike racks are constructed with a frame from 1-5/8" (41mm) O.D. galvanized tubing and 5/8" (10mm) O.D. galvanized rungs. Bike racks are assembled using galvanized heavy-gauge stampings. Single-sided and double-sided racks and add-on units available to create longer bike racks for your specific requirements. Rack capacity is one bicycle per foot per side.